Elmira College purple and gold football. Elmira College purple pennant with the Elmira College logo and 'Elmira' on it in gold writing. Medium-sized. Elmira College purple pennant with 'Elmira College Soaring Eagles' and an eagle on the front in gold writing. Medium-sized. Elmira College purple pennant with 'Elmira College' on the front in gold writing and a gold stripe around the banner. Large-sized. 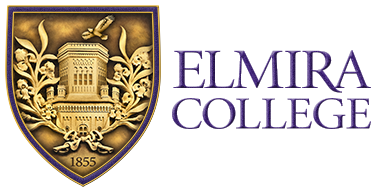 Elmira College Pennant. 18x36 in size.